Where QuickBASIC gets much more powerful. then please consider making a small secure donation via PayPal. Simply click on the donate button to proceed! It is much appreciated. The most powerful and newest DOS IRC client. 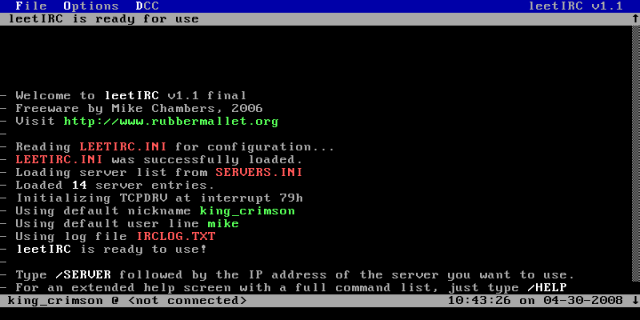 leetIRC is a DOS-compatible Internet Relay Chat (IRC) client application. There are a lot of other DOS IRC clients available out there on the internet for you to use, but I thought they were all severly lacking! They had nothing but the most basic features, and most were difficult to use and had an extremely primitive user interface. They can be very hard to configure as well. Or, if you're a more experienced user you can simply edit the LEETIRC.INI file with the text editor of your choice. Like everything else on my site, this application is considered "freeware" and the GNU GPL v3 license applies to it's distribution, and it comes with the complete QuickBASIC source code. The current public build is version 1.1. Download by clicking a link below! Bookmark this site and stay tuned for the soon-to-be released version 1.2, which will add many features and update existing features. The routines that draw the display will show a nearly 400% speed increase, which making this software much nicer to use when you are on an extremely old system such as an 8088-based PC! This page was last updated on 7-12-2008.